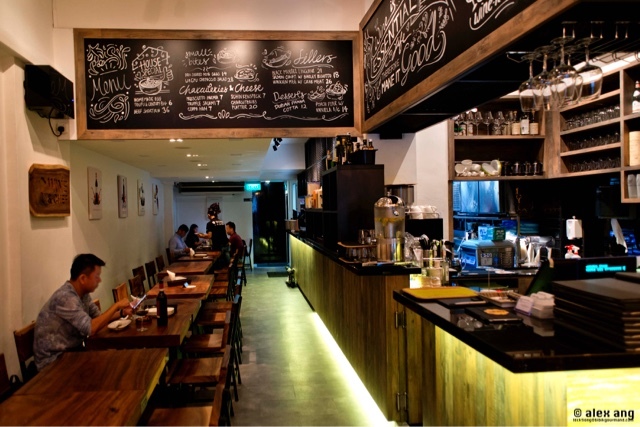 It’s true that Burnt Ends is one of few restaurants on the Keong Saik Road stretch that gets particularly busy for dinner but this week, we discovered that a relatively new restaurant, Wine & Chef, is also packed to the rafters by dusk but with a decidedly younger crowd who comes for the range of affordable Italian wines. Owned by SG Wine Cellar, an online wine retailer, in conjunction with Papawines, a wine distributor from Italy, Wine & Chef offers about 250 types of Italian wines by the bottle (priced from S$25++ each) sourced from 42 wineries, mostly small and family-owned businesses, of which about eight to 10 of them are available by the glass at an affordable price of S$6-S$8 each. 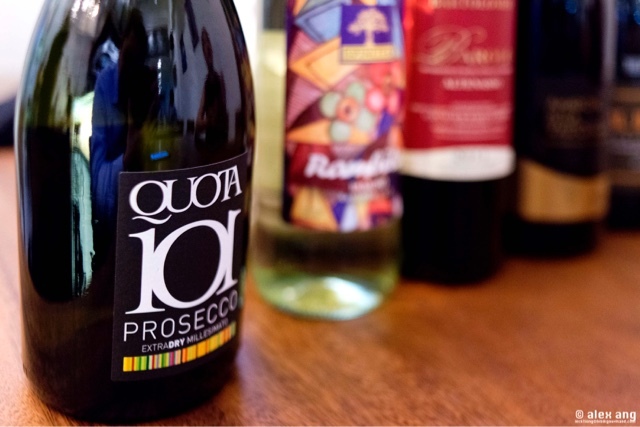 While you could buy these wines home to consume at leisure, some patrons pick their bottles from the walk-in wine cellar and consume them in the 48-seat shop house space (service charge of 10% applies for items consumed in the restaurant). A bottle of Alternasso Barolo DOCG by Cavalier Bartolomeo, for instance, costs S$59 per bottle and if you choose to drink the bottle in-house, you pay an added 10% service charge. As its name suggests, Wine & Chef is created to put the spotlight on both the wines and the food. But with such a strong wine proposition, the kitchen is working doubly hard to make its food offerings compelling. Enter executive chef, Wilson Ang, who wields an unorthodoxed menu that brims in part with tasty mod-Sin creations and in part with Italian fare. 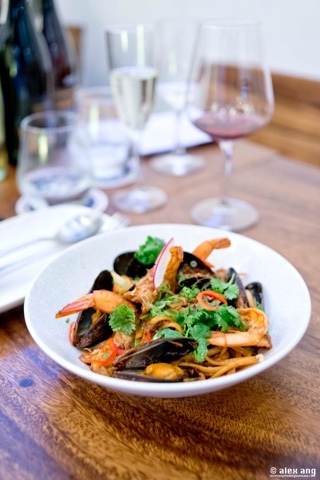 Even if we are not fans of the firm rather than plump mussels, one of the highlights includes Ang’s rib-sticking take on Hokkien mee (S$26++), linguini tossed in seafood broth with blue swimmer crab, tiger prawns, squid and the said Chilean black mussels perfumed with pork lard. 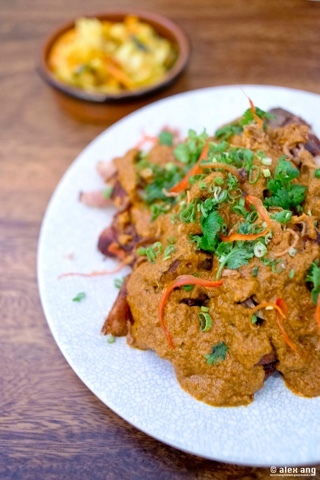 If you’re in a group of three or four, order the curry pork knuckles (S$20++), a huge mound of pork knuckles that are first sous-vide, then deep-fried and doused in a robust homemade Peranakan curry so spicy that it could make a grown man mist up. 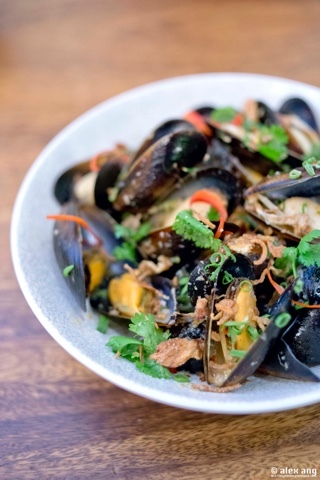 The dish of steamed black mussels (S$18++) holds some potential too, if only Ang could replace the Chilean mussels with plump bouchot mussels or equally succulent bivalves from Norway.